Now that 2015 is in full swing, here’s a look back at what happened in the Netherlands in 2014; and a peek forward at what’s to come in 2015. With several fellows living in or around Nijmegen, we now have regular meetings at Linux Nijmegen. We now have a Dutch Team! Consisting of André, Jeroen, Kevin, Maurice, Nico, Roel, Willem, and myself. Contact us at netherlands@fsfeurope.org. André & Nico are doing a wonderful job translating & proofreading. Thank you! I became a regular volunteer at Bits of Freedom‘s Privacy Café (where I also try to tell visitors about the importance of Free Software and hand out FSFE leaflets). We started the year with a CryptoParty at Linux Nijmegen on 14 January. Maurice and I visited our neighbouring fellowship group in Düsseldorf several times in 2014. We had a Benelux Fellowshipmeeting at FOSDEM 2014. I attended EPFSUG‘s “Trust your friends” event at the European Parliament, which featured the official launch of DebianParl. We asked Dutch candidates in the European elections to sign the Free Software Pact; several did and some of them were elected! I wrote about The Importance of Free Software. I held a lightning talk about the importance of Free Software at a Privacy Café in Utrecht. We had a Dutch Fellowshipmeeting in Utrecht on 24 May at the Dutch Linux Users Group (NLLGG)‘s bimonthly meeting. Maurice and I attended FSFE’s Germanophone Team Meeting 2014. I led a workshop on Privacy and Free Software. Maurice, Kevin and I spoke at T-DOSE. A lot of Dutch fellows were there, and of course we brought the FSFE booth. André, Maurice, Willem and I visited our neighbours at OpenRheinRuhr. 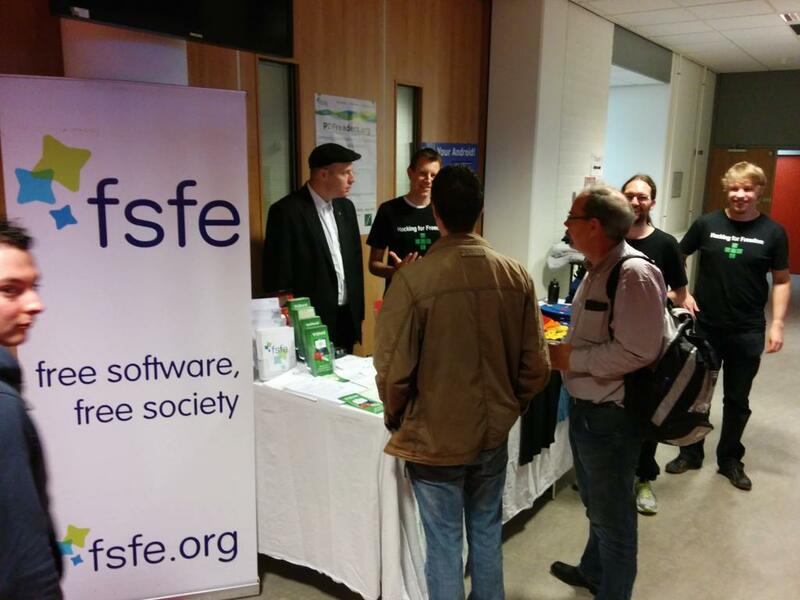 I even sold a few T-shirts at the FSFE booth. We’ve started contacting Dutch companies and organisations to raise funds for FSFE’s work in 2015. Maurice and I attended the 31st Chaos Communication Congress and also visited FSFE’s assembly. I organised the first Privacy Café in Nijmegen. Nicolas Dietrich, Max Mehl and I are candidates in the Fellowship Election 2015. See you at FOSDEM 2015! I’ll probably spend a fair amount of time behind or near the FSFE booth. There will also be another Benelux Fellowshipmeeting. We’re ambitious to do even more in 2015 (now that we have a bigger Dutch Team) and we’re still looking for ideas (and we can use your help). If you have ideas or suggestions for our work in 2015, want to ask a question, or if you just want to say hi, feel free to contact us at netherlands@fsfeurope.org or via the (public) Benelux mailing list (which also features discussions and announcements). That’s it for now. I’m excited to do even more in 2015. Thanks everyone! This entry was posted in english, planet-en and tagged 2014, bnl, fellowship, free software, fsfe, kevin, maurice, nijmegen, nl by Felix. Bookmark the permalink.